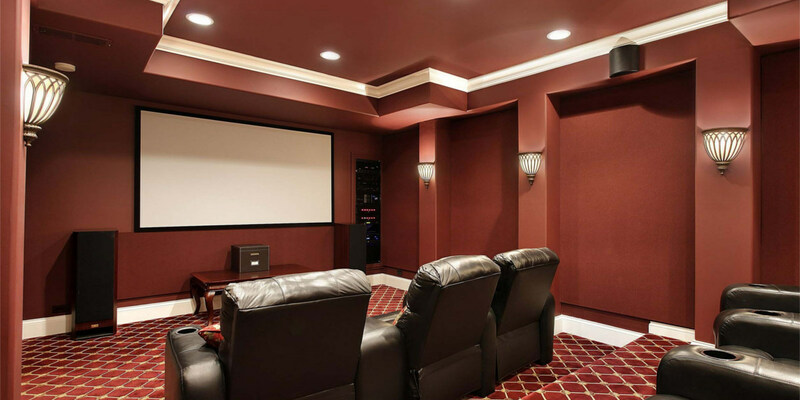 If you call yourself a movie buff and enjoy a comfortable living, then having a home theatre at your place is absolutely a must. 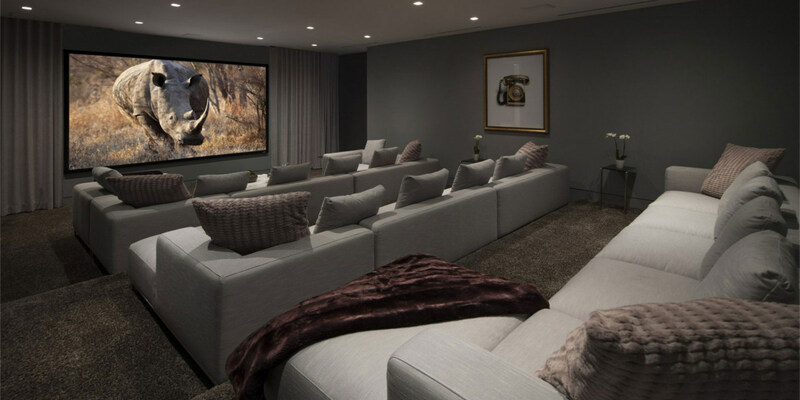 And, we can speak on the behalf of all the movie lovers that at least for once they must have thought of owning a comfortable and lavish home theatre in their respective homes. Coming back to the subject, right from small and cosy to extensive and accommodating, we have today gathered a total of 10 media room designs that will certainly be enjoyed by you irrespective of the size of your place. 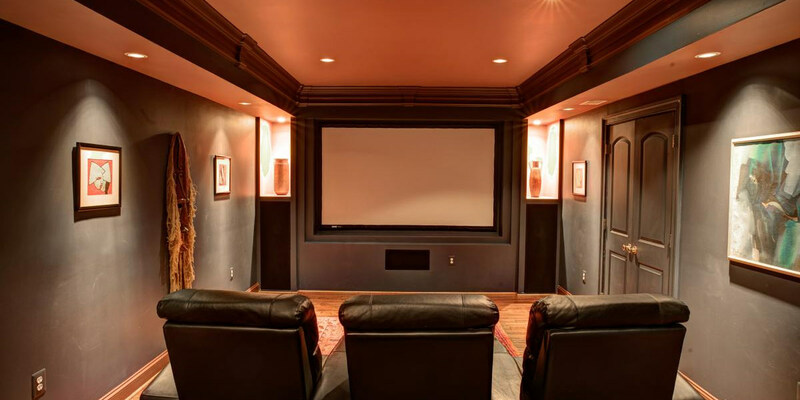 Large modern enclosed home theatre is complemented with a projector screen and neon lights lit on the side walls and the roof. The placement and colour of the lights help to set the ambience of the room. 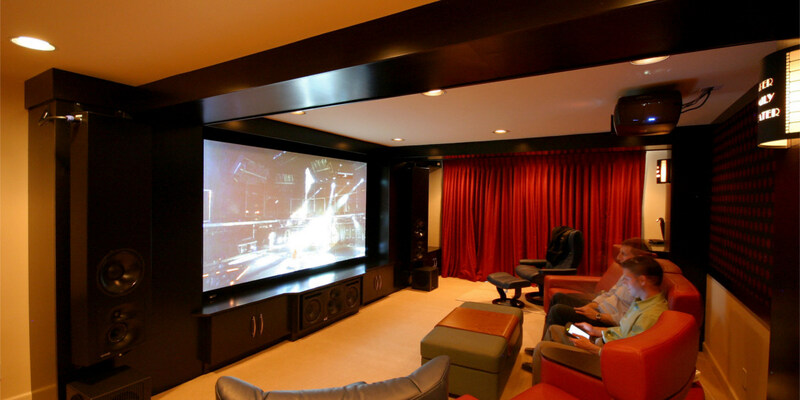 With a sofa set, this home theatre is surely as big as comfortable and snug. This classic living room home theatre carries pastel neutral vibe with cream tone couches and wooden base flooring and light and dark grey walls. 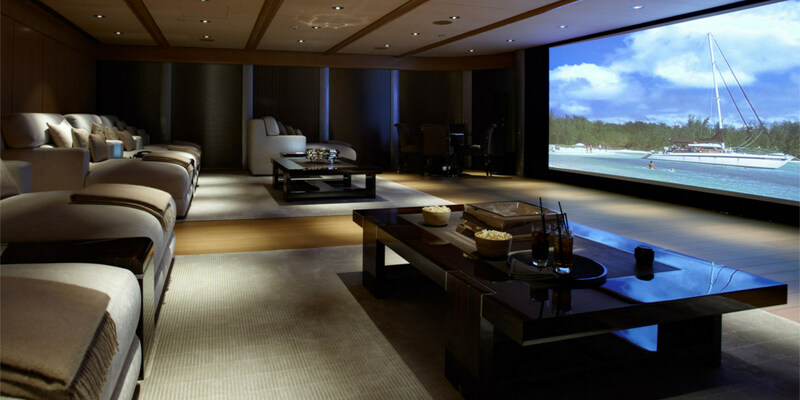 The subtle interior along with projector screen completes the look of this contemporary media room design. 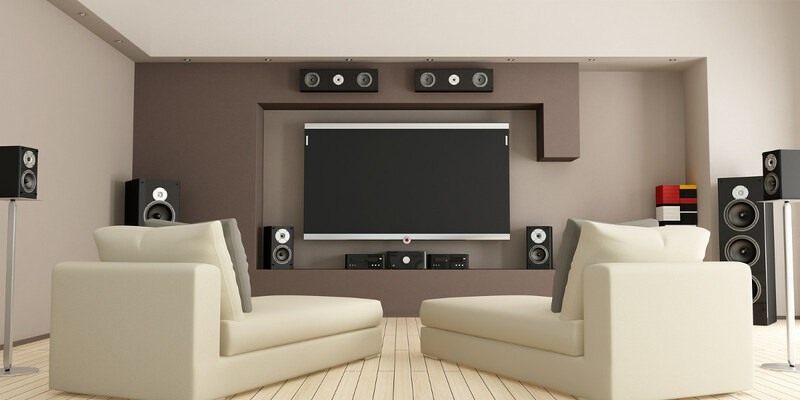 If you have a large space in your home for home theatre, customise it by including raised platforms or steps like an actual theatre. With carpeted flooring, comfortable couches and well-lit interiors, the ambience of the room will duly compliment your love for movies. 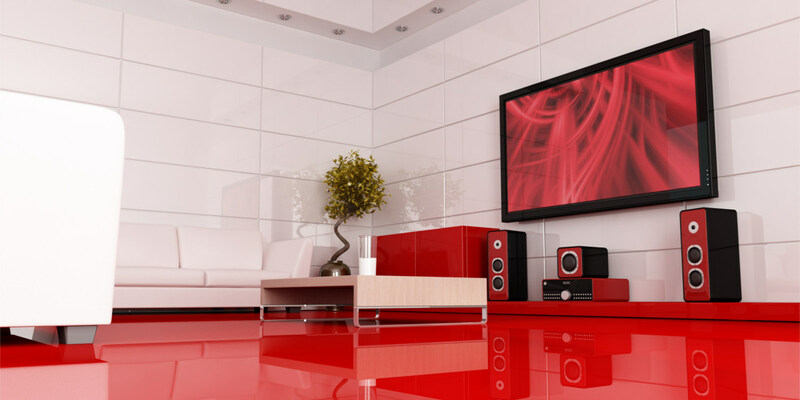 If you don’t mind adding a bit of colour to your media room, this red coloured theme home theatre is best to create a very happening and lively space for enjoying the movies with family and friends. If your home theatre is accommodated in a small space, try and cosy up your space by adding knit pouffes and other paintings and personal accessories to make the room feel more warm and welcoming and also up with the latest knit trend. If you wish to go for absolute subtlety and want the projector to be the sole focus in the room try and include very soft cream or light brown shaded furniture pieces and carpets. Also, don’t forget to include lamps and other lighting fixtures to make the room comfortable and well lit. Another style to try for big spaced home theatres is to include separate sofa seats and tables for snacks and individual enjoyment. 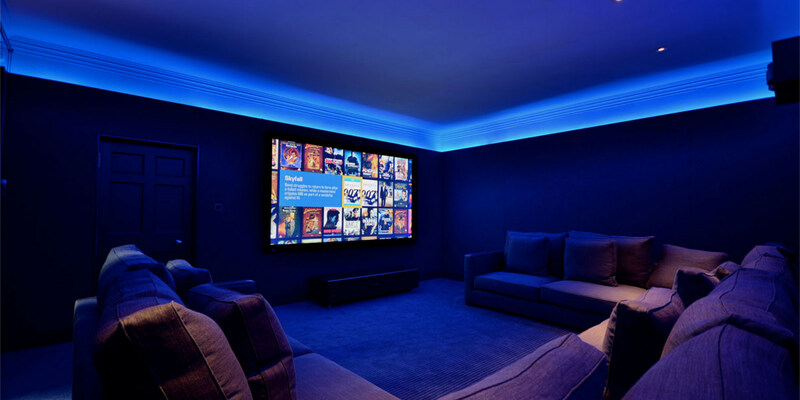 Include plenty of soft light to make the room bright and pleasant for enjoying your favourite movie. 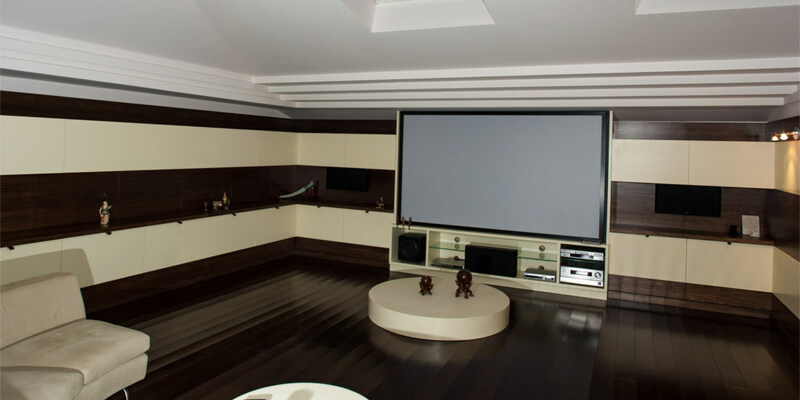 Large walls, carpet, projector screen sofa and table, the design of the home theatre looks unique with the screen placed interestingly on a large wall. 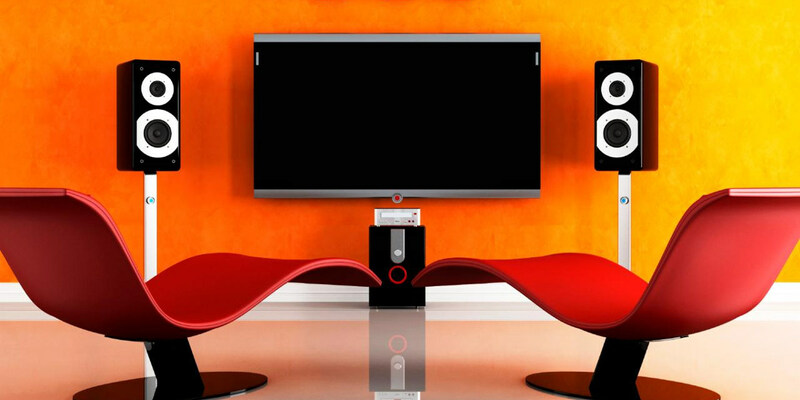 Try and include wall fixed lamps to enhance the space in the media room. If you are not hesitant to try something unique and edgy we would suggest you go with this orange and yellow-hued walls complemented with relaxed red reclined seats. You don’t need a separate media room for this setup, you can accommodate the required seating and projector screen in an empty guest room. If you wish, you can even add hardwood floors to your media room to make the look more elegant and classy. Try and include any one of the design to bring a trendy and eye-catching makeover to your much loved and enjoyed movie time and area.